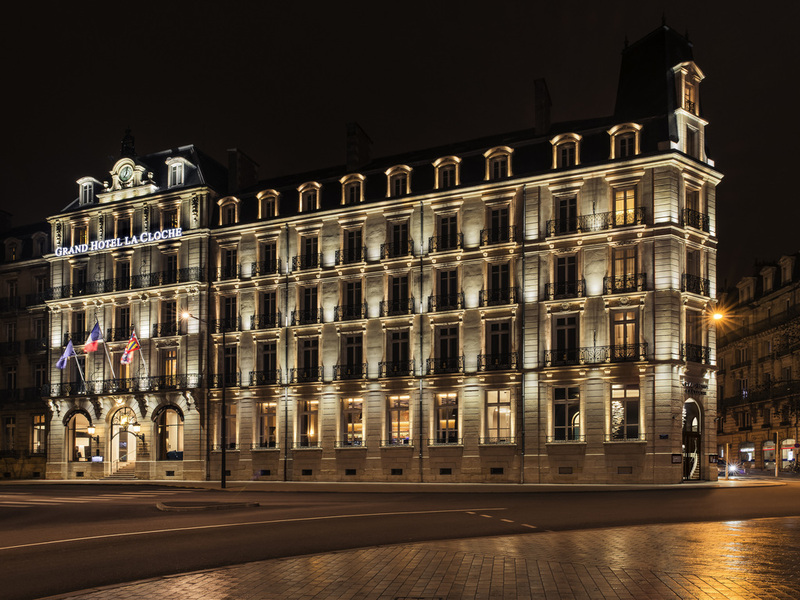 Exceptional and recently renovated 5-star hotel in the heart of Dijon. Enjoy the Les Jardins By La Cloche restaurant with its Maître Restaurateur label. Art takes pride of place in our hotel. Relax with Carita or Vinésime treatments from Spa By La Cloche. Haussmann-style splendor, listed as a historical monument. Our luxurious rooms and suites balance refined decor with modern amenities, including Internet access and cable TV. Plush beds ensure peaceful sleep and our professional staff and 24-hour room service are available to cater to all your needs. The fully refurbished Les Jardins by La Cloche restaurant offers modern cuisine and great food and wine combinations. Orchestrated by Chef Aurélien Mauny, the gastronomic menu changes with the seasons to show off the best local produce. Sink into a padded red or blue armchair in the cozy hotel bar and sip an espresso or specialty tea with a fresh pain au chocolat. Light jazz music creates a soothing atmosphere for a tête-à-tête with colleagues or a glass of fine Burgundy wine.